This weeks blog is continuing on from last weeks theme of shame. Previously I looked at an example of post death dissection by surgeons and the wider social effect it had on the immediate family of the condemned. 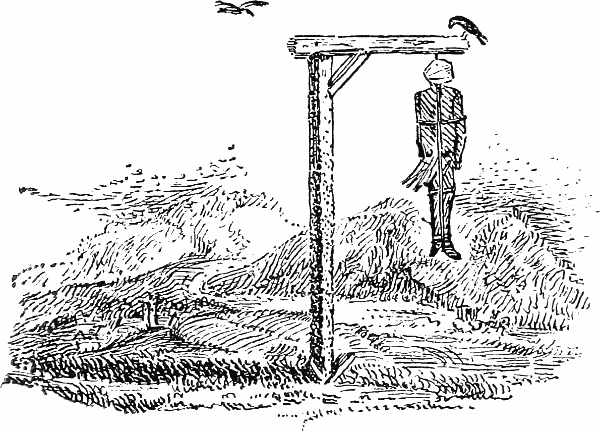 This week, I will look at a case involving gibbeting or hanging in chains. the number of these distressing objects which throw themselves in our way in almost every Common in England. The loneliness of the bleak moorland was quite enough to invest it with terror to travellers a hundred years ago and occassionally there were incidents that served greatly to enhance the evil repute of the locality. opened the door of the post-chaise and presented the weapon at the lady’s head. His actions procured a reasonable amount of reward, but clearly not enough as he was to rob again. Unbeknownst to Hazlett, the woman, after being robbed, passed the mail-bag carrier on her way back and forewarned him of the highwayman stalking the Fell. Rather astonishingly it appears that, despite the warning, the mail man mistook Hazlett for a simple peasant and rode alongside him for a while, even warning him about the highwayman on the loose! unsurprisingly, Hazlett duly robbed the man at gun point and went on to chance his arm once more that night. But that was to be his last attempt and he was caught and arrested the following day and was found in possession of some of the contents of the mail. Unfortunately for Hazlett, despite the provisions of the Murder Act being expressly for the crime of murder, some exceptions were made and robbing the mail was one of these. As such, he was sentenced to be hung and then gibbetted at the scene of his crime. The location of most gibbets were placed on or very near to the scene of the crime as a definitive reminder to all who passed of the grim rewards of a life of criminality. Passing the site of his gibbet 2 years later (1772) the Reverend James Murray penned the following note. Unfortunate and infatuated Hazlett!…hadst thou robbed the nation of millions, instead of robbing the mail and pilfering a few shillings from a testy old maid, thou hadst not been hanging a spectacle to passengers and a prey to crows. Thy case was pitiable, but there was no mercy : thou wast poor, and thy sin unpardonable. Reverend James Murray’s’ Travels of the Imagination, a True Journey from Newcastle to London cited in J. C, “Travels of the Imagination.,” Monthly Chronicle of North-Country Lore and Legend 5, no. 58 (December 1891): 564–65. The place where Hazlett hangs is the finest place in the world for the walk of a ghost. At the foot of a wild, romantic mountain, near the side of a small lake, are his remains. His shadow appears in the water, and suggests the idea of two malefactors. The imagination may easily conjure up his ghost. The Pond was named after Hazlett, as many sites of gibbeting were, and it was only when the land was bought years later and the pond drained by the owner, that it lost its marking. But what of the shame I hear you cry. Well, as with last weeks tragic case, there is a human angle that always gets lost in stories of crime and punishment and Hazlett’s is no exception. One small note in Sykes local Records (1833) indicates the tragedy it caused his family. Soon after he was hung in chains, a person advanced in years, was observed several days to go and kneel before the gibbet, where he remained a considerable time, regardless of the wet weather. The last day in particular he prostrated himself on his bare knees for upwards of an hour, and became so enfeebled that he could not rise till some people gave him assistance; after which he drew out of his pocket a hatband, and putting it on, said he then was easy, and took his leave of the melancholy spectacle before him. It was thought that this person was his father. Sykes, Local Records; Or, Historical Register of Remarkable Events, 1833, 245. 1). Tarlow, Sarah. “The Technology of the Gibbet.” International Journal of Historical Archaeology 18, no. 4 (September 14, 2014): 668–99. In fact, I’m currently in the awkward position of drafting a line of argument in one of my thesis chapters that says as much, effectively contesting an assertion made in my Supervisor’s excellent book Rogues and Thieves (does the shameless plug now excuse me!) that argued that women were more likely to be dissected than men. I disagree, but I don’t have 4,000 words here to explain why. 2). V. A. C. Gatrell, The Hanging Tree: Execution and the English People, 1770-1868 (Oxford University Press, 1994), 267. I just took up a free trial of NowTV as I wanted to see some of the many great arts programmes Sky seem to be doing these days (Nb: this is not a plug, i got the free 30 day trial and, subject to remembering, will be cancelling on day 29). One of the documentaries available was on Joni Mitchell. I came to Joni Mitchell quite late in life, having been previously obsessed with the men of the 1960’s folk scene (particularly Bob Dylan, John Martyn and Richard Thompson). Increasingly though, it is Mitchell’s music that I turn to. It’s the poetry of her work that gets me every time. This documentary tracked her life, loves (amongst others Graham Nash of Crosby, Stills and Nash) and lyrics and highlighted her admirably stubborn refusal to be moulded by the music industry. One particularly funny scene is when she describes the pressure from her manager to write a “hit”, the result of which was You Turn Me On I’m A Radio, a song in which she deliberately included as many different corny radio clichés and words like radio/network/broadcasting tower as she could cram in, as she knew radio stations wouldn’t be able to resist playing it. Unsurprisingly she didn’t seem to hold the song in high regard, the irony that it is one of her best known songs now is not lost on her. Perhaps the most beautiful song of the documentary, one i have often passed over, is Little Green (the song she wrote for the 1971 Album Blue, about the daughter she gave up for adoption – a fact that wasn’t publicly known until someone leaked a story in the press in the 1990’s). The song is about the daughter she gave up (they have since been reunited) and with this fresh in my mind the song seemed all the more heartbreaking. Call her green for the children who’ve made her. The cover image from Oliver Sack’s ‘The Man who Mistook his Wife for a Hat’. The image is a nod to Magritte’s famous painting of a pipe (or was it?) 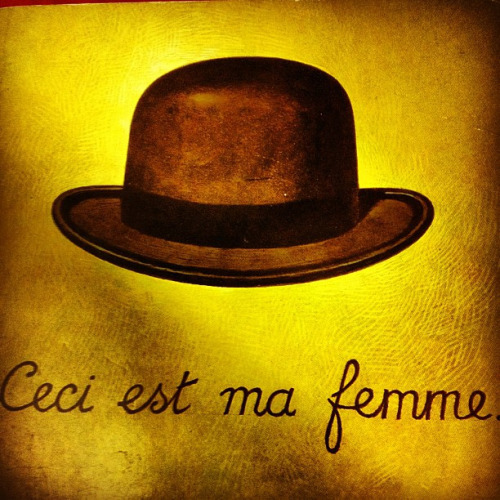 entitled The Treachery of Images (1929). I asked him to imagine entering one of our local squares from the North side, to walk through it, in imagination or in memory, and tell me the buildings he might pass as he walked. He listed the buildings on his right side, but none of those on his left. I then asked him to imagine entering the square from the south. Again, he mentioned only those buildings that were on the right side , although these were the very buildings he had omitted before. The title of the book derives from Mr.P’s affliction which, in extremis, leads him to attempt to pull his own wifes’ head off, believing it to be his hat. It was the books preface, however, that was of particular interest to me. In it Sacks pines for the ‘richly human clinical tales’ that he believed reached their zenith in the ‘nineteenth century’ and is highly dismissive of the modern clinician’s tendencies towards ‘case histories’ which ignore the human. modern case histories allude to the subject in a cursory phrase (‘a trisomic albino female of 21’), which could as well apply to a rat as a human being. To restore the human subject at the centre – the suffering, afflicted, fighting, human subject – we must deepen a case history to a narrative or tale; only then do we have a ‘who’ as well as a ‘what’, a real person, a patient, in relation to disease – in relation to the title. He (Sacks) compared the modern clinical practitioner to the man who mistook his wife for a hat—able to register many details yet still miss the person entirely. The books admirable intentions to make sure the human is never detached from their affliction is not without its flaws though. In Sacks’ attempts to locate the ‘human’ we are often presented with the funny/quirky things their affliction makes them do, which makes our role as the reader difficult to navigate (are we learning from or laughing at?). However, it is a wonderful work of deeply engaging, often tragic tales of human illness and a clarion call for a more human centred approach to medicine.